Operation Hammond has grown by leaps and bounds in the past five years. We have supported many events & conventions, meeting many interesting people within the nerd and pop culture community along the way. At many events we have gone to, we kept running into a group of fellow nerds who call themselves Nerdfit. They are an entertainment group based out of Boston. They are fun-loving nerds who enjoy going to many of the same events that we also attend. Their zany antics and awesome panels have been known to be among the highlights of many conventions and the stuff convention lore and mystique. This legendary group also sells cool, convention and nerd inspirited T-shirts. Our Chairman and Founder James Fedora got to talking with Erik Farris about various issues that happen at conventions both groups attend. As the conversation went on, our van came up. Our van is kind of an odd duckling just within the simple fact that it’s a gold, 2001 Chrysler Town and Country it’s the kind of van your dad would drive. Coincidentally the van once belonged to Fedora’s dad before being sold last year to Operation Hammond at a discounted price. 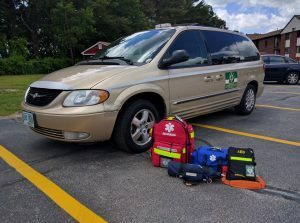 The van being sixteen years old, required a lot of work to be road worthy and to pass inspection, work that Operation Hammond was happy to put in with the help of its members. After a year of ownership, we decided to upgrade the van to something befitting an organization like ours. It’s one thing to have a vehicle that can pass a state inspection, it’s another to have a vehicle that has unique style befitting of our organization. Over the duration of May, we made extensive upgrades to the van. The braking system was upgraded and overhauled to improve stopping distance when the van is fully loaded, body work was completed to remove corrosion, outside trim was resurfaced and painted, new internal and external LED light bars and reflective markings were added, seating was modified for superior comfort, and lastly, the exterior of the van was detailed to a mirror shine. All of these modifications allow OH members to arrive at events both well prepared, comfortable and in style. As Fedora was discussing the van with Erik, they noticed a problem. All great things should also have a great name. In an effort to solve this unique conundrum, we are teaming up with Nerdfit to help name our van. Us and Nerdfit have come up with a few nerdy, crazy and cool names to choose from. 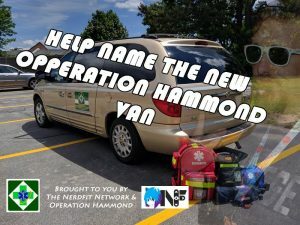 To participate log on to either the Operation Hammond facebook page or the Nerdfit facebook page to cast your vote! Update: 9/12/16: The winning name is Jean Claude VAN Damn! Be sure to check out our van with its new name at one of our upcoming events! The Nerdfit Network LLC (“Nerdfit”) is a Boston-based entertainment group has delivered hours of laughs and amazement at events since 2007. Nerdfit provides a versatile list of talents including (but not limited to) hosting and performing in panel presentations, game shows, concerts, and dance parties. From the panel room to your computer screen, they aim to provide you with the highest quality of professionally unprofessional content. You might remember us from the following events: MAGFEST, AnimeUSA, ConnectiCon, NautiCon, NatsuCon, Animation & Gaming Ohio, Anime Next, Anime Boston, Another Anime Convention, Steampunk Worlds Fair, TempleCon, DerpyCon and many others!